It’s that time of year again as Easter is upon us with all its encouraging invitations to indulge in as much delicious chocolate as we fancy. And it goes without saying, during this famous season, that there’ll be one type of chocolate that we can’t celebrate the festivities without… the chocolate egg! It will come as no “surprise” that here at Kinder Surprise World, we take chocolate eggs especially seriously in the spring months. We know a lot of you will be after your Easter eggs, but why not indulge just that little bit further and have your chocolate eggs with magic toys inside? That’s why we’re delighted to stock the entire range of Kinder Surprise Maxi Eggs – limited edition Easter eggs that come in a number of different themes.Available as 100g, 150g, 220g and whopping 320g-sized eggs, Kinder Maxi Eggs are your must-have Easter eggs and come with some of the most amazing Kinder Egg toys inside. What are Kinder Surprise Maxi Eggs? The Kinder chocolate is irresistible as always, being the same delicious and creamy chocolate you’ve come to expect from Ferrero throughout their proud history. The chocolatier’s trademark milk chocolate forms the shell of these enticing eggs, while you’ll be met with the same delightful surprise as always from the rich white chocolate lining once you crack open the chocolate. However with Kinder Maxi Eggs, things are different, and where these eggs really stand out is with the Kinder egg surprise toy inside. Each egg contains a giant toy, hidden inside a capsule, and sure to be met with a round of smiles when discovered. With toys matching the exciting themes on offer, each Kinder Maxi Egg is incredibly rare to find in the UK – meaning your toys are worth more as collectables, and worth even more in appreciation in the playground! 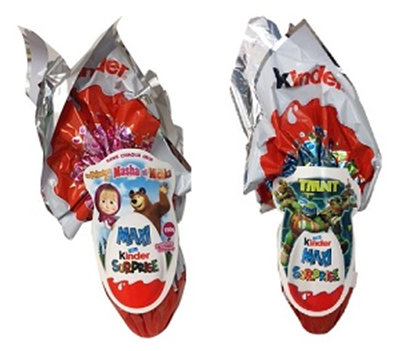 All with rare collectable Kinder kids toys inside, enjoy the excitement on your little one’s face,or cram amazing chocolate into your own face, with our limited edition 2017 Kinder Surprise Maxi Eggs. What are the different types of Kinder Surprise Maxi Eggs? 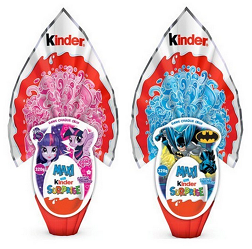 Starting off our fine selection of Kinder Maxi Eggs are the 100g editions, available with a Transformers or My Little Pony theme, providing a delightful snack and magical toy inside that’s sure to keep little ones entertained for hours. So whether you want to join Optimus Prime and the Autobots, or you want to enjoy the magic of winged horses and unicorns, this egg gives you one of this year’s hottest Kinder Egg toys to do it with. Let’s take a step up the chain and look at our 150g Kinder Maxi Eggs. Just as delicious, but with even more exquisite milk and white chocolate on offer, these larger Kinder eggs boast new and exciting themes. Choose between Teenage Mutant Ninja Turtles and Masha and The Bear (if you can)and enjoy a rare collectable toy with a chocolate egg that lasts that little bit longer. 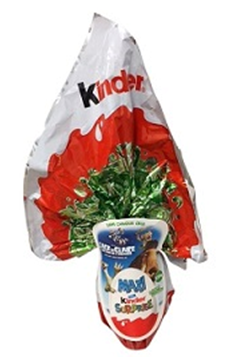 If all that delicious velvety chocolate isn’t enough for you, why not try our 220g Kinder Maxi Eggs? They come in a fun Ice Age 4 theme, perfect for girls or boys, with a toy that lets you play along as if you’re part of Sid, Manny and Diego’s gang. Even as we head into summer, you can stay cool with your Ice Age-themed Kinder Surprise toy. So, there you have it…. our exciting line-up of 2017’s Kinder Surprise Maxi Eggs. It goes without saying that there’s some tempting chocolate and some seriously cool toys on offer with every one of our eggs. But, remember, they’re limited edition and only here for the year! So enjoy your chocolate eggs the right way in 2017 with these heavenly Kinder Surprise Maxi Eggs.